Welcome back to the final show of Potsdam Now! 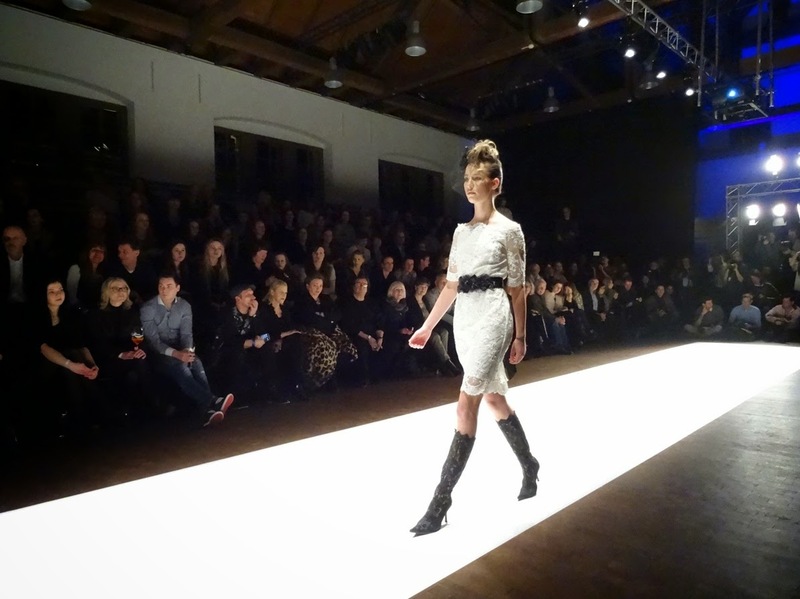 Fashion, the newest addition to Berlin Fashion Week, which ended last night. 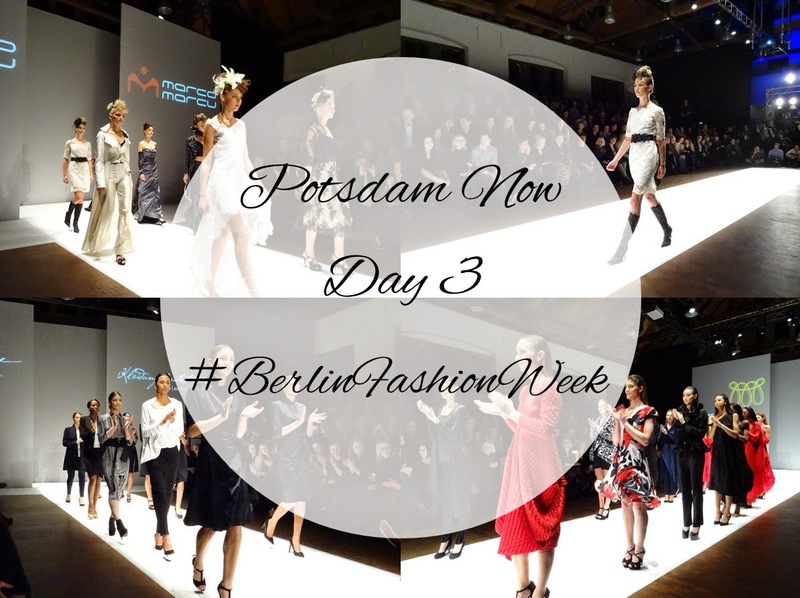 Join me for a final time (please read my Potsdam Now Day 1 post) and admire German designs from Potsdam and Berlin. Believe it or not, I found someone at the event who knew what Wifi was and who could give me a password to sign in! 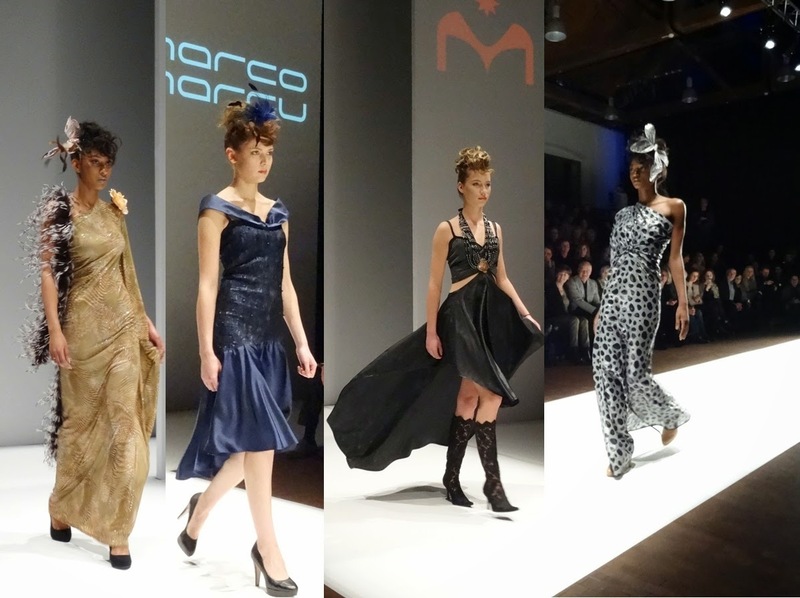 So with internet access and live correspondence sorted, I was looking forward to 'Germany's Finest' which kicked off with Marco Marcu, a designer based in Potsdam. 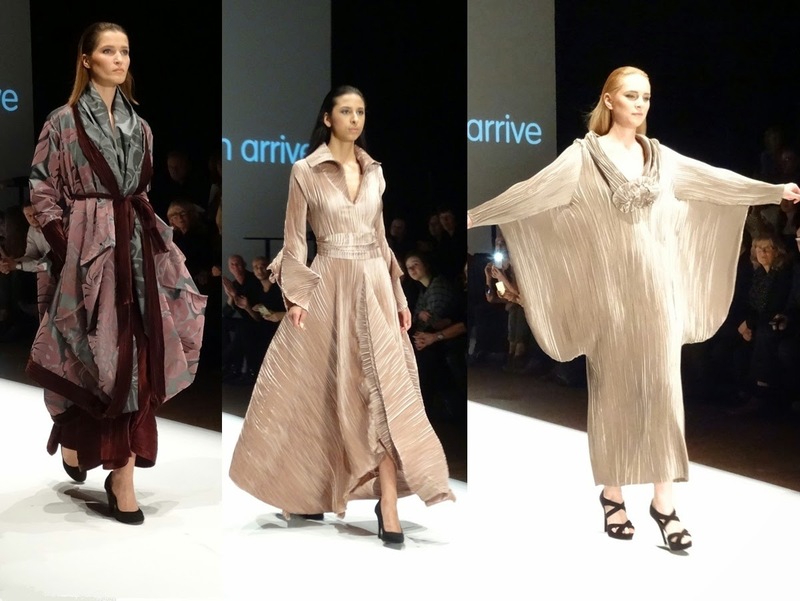 The show opened with some very typical German designs, wild mixtures of fabrics and colour (e.g. feathers to glitter, lace over beige) that didn't really go well together and made the overall impression look tacky than sophisticated. 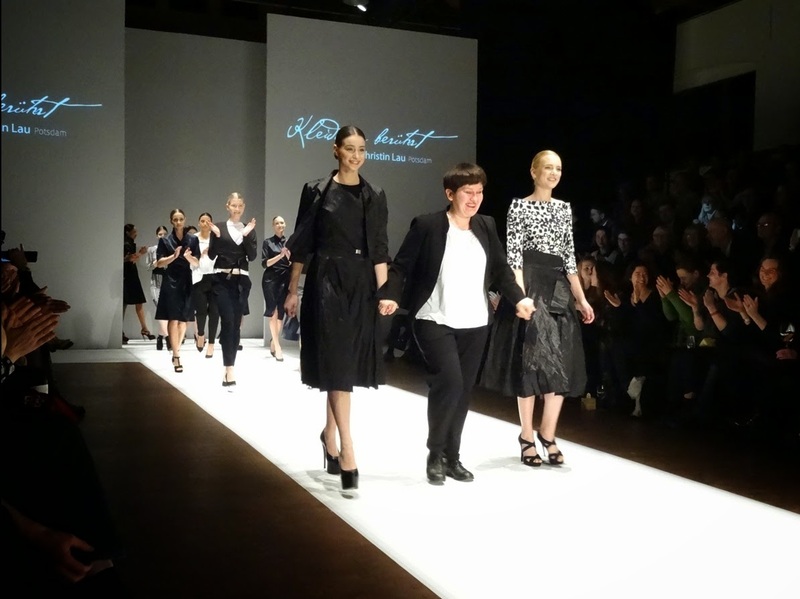 Whilst some of the styles are on trend in Germany (picture 5, black lace dress at the front), I wouldn't wear it simply because I find German fashion 'altbacken' (eng: fuddy-duddy, old-fashioned) which most designs were. However, it got better when the model in the white lace dress appeared (pic 3). This look was very nice and wearable. White lacy dresses are so on trend and in combination with the unique shoes a design to die for. The Leopard jumpsuit was another highlight which would look stunning at a summer party or at the next Ascot/Cheltenham racecourse. 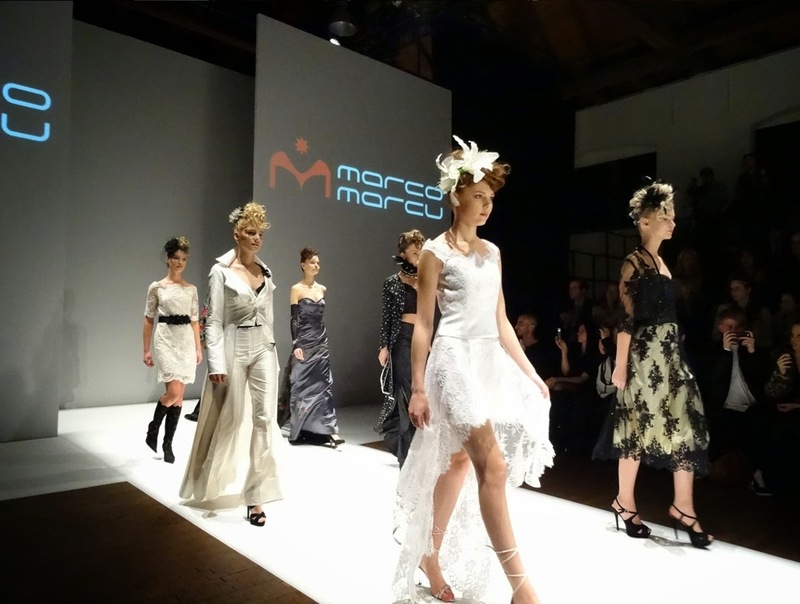 Looking back at the fashion presented on Tuesday, Marcu's collection left me rather reserved than excited. 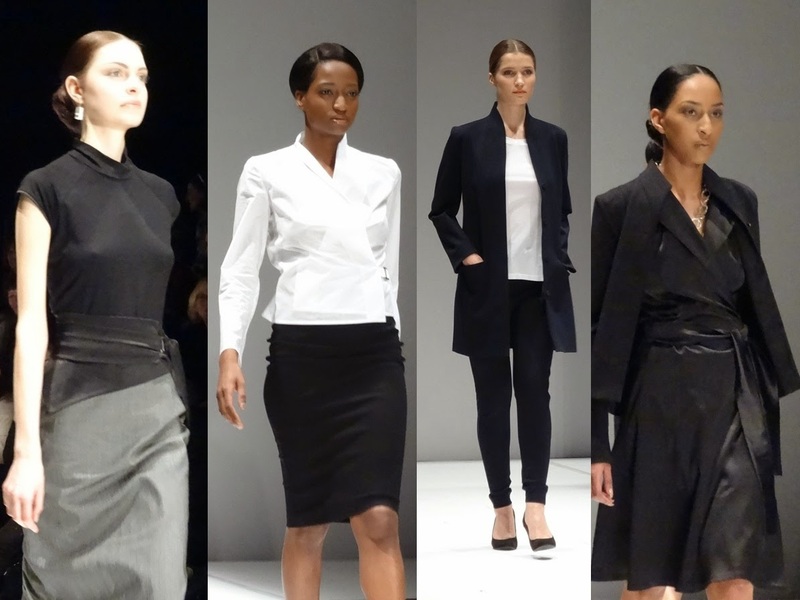 I was extremely disappointed by Christin Lau's collection, which dominated in black, white and grey colours. Whilst I appreciate all of the effort and time that went into designing this collection, I could see Lau's pieces as a very clear representative of German attitude and values, which I, as a German absolutely despise. 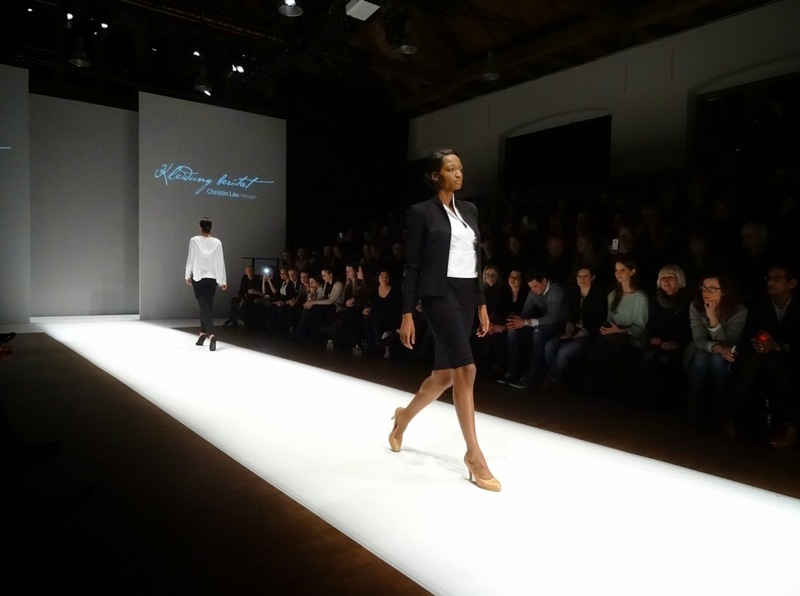 German's LOVE work, so it goes without saying that all the women at the venue LOVED this very uninspiring office wear. Germans, in general, have a weird understanding of fashion: the average German woman needs functional and practical clothes, she never has anything too fancy in her wardrobe because everything that could make her stand out from the crowd frightens her and it is not in a German's nature to 'be special or individual' nor to have any kind of 'fun' with clothes. Her wardrobe is usually dominated by Blazers, uni-coloured stiff blouses with clear cuts obviously. Again nothing too fancy that could make her look a tiny bit different or, beware (! ), casual. Don't get her started on colour or clothes she has bought by accident. A German would NEVER EVER buy a piece that lies around in her wardrobe and was a money waster. All of her clothes were neatly selected after a long and draining process of making decisions. The hard earned and neatly picked pieces are accurately counted and ALL have a specific purpose for Monday, Tuesday, Wednesday, Thursday and Friday. Fit in and make your country proud. So in Lau's case, you play it safe and you produce what the market demands: boring, rational and unspectacular clothes that represent all of the aspects mentioned above. Don't get me wrong, there's nothing wrong with classy and basic pieces, but during the show, I saw the same static fashion in various forms over and over again. This surprises, as her label claims 'Clothes that inspire and touch' but to be honest, I wasn't touched at all. To me, she delivers a very German statement that is as old as the Stone Age: clothes have to be practical, nothing fancy. They have to be absolute, plain, dull and non-descriptive, so no colour to attract any form of attention or could brighten up your mood. Your clothes need to reflect you as an efficient and hard-working individual. Spotless material and clear cuts show your flawless modesty that you can live with little and don't aspire luxury at all. Don't use accessories or fancy cuts, because that's a superfluous distraction from your main statement. You follow rules and laws meticulously, you would never experiment with fashion and after all, fashion is part of consumerism which could turn you into some sort of superficial nitwit/ brainwashed puppet of society. NO, we Germans can't let that happen, so we stick to our old ways (which were always the true ones anyway) and we will never let any kind of change happen. OUTRAGEOUS! 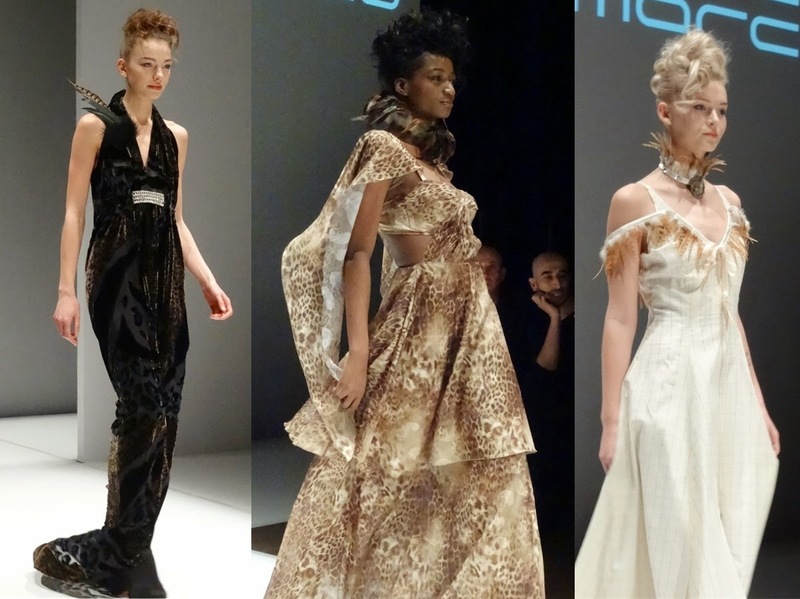 Mashiah, a blind Israeli designer based in Berlin opened his show with a few styles, made of a material that looked like carpet. The burgundy tones with massive flowery prints were definitely a statement but not so much my taste. The rest of the collection was dominated by pleat. I'm not a massive fan of pleat, especially if you have to see it in all variations with minimal deviation. Repetitive in style and colour were most of the showcased dresses, which got better towards the end of the show. 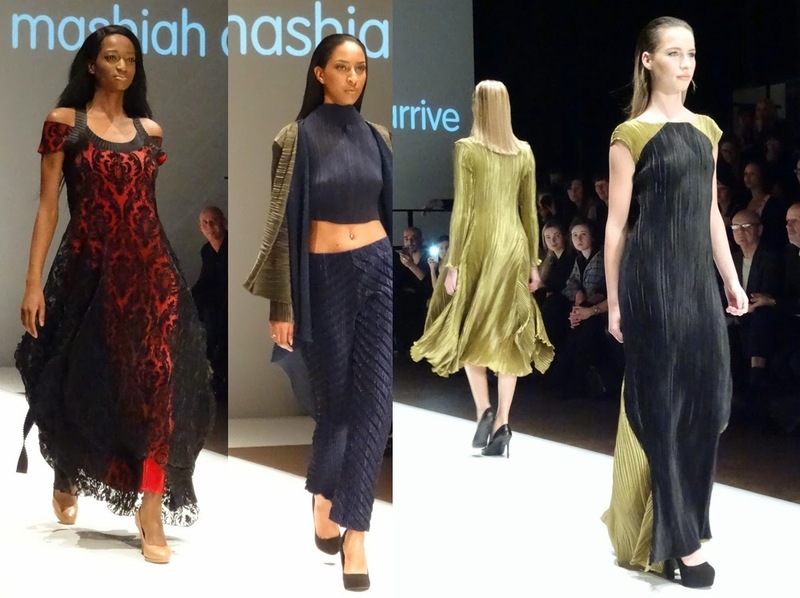 My favourite pieces were the green/khaki dress in picture 3, the paisley coat in picture 6 and the key masterpiece, the black tulle dress. Again I missed the wow factor and excitement from Tuesday's shows. In contrast to Day 1, Day 3 was a rather unspectacular fashion day. Wowed by the designs of Tuesday, I came back hungry for more sophisticated and bang on trend statement fashion and with very high expectations. Those were little fulfilled. It could have been the fact, that I was without charming company this time or that the 1h break in between each show was far too long. There was little to do nor any kind of entertainment to make the time go pass by. The DJ, a friend of Wladimir Kaminer's infamous 'Russendisko' (Russian Discotheque) played Russian folklore, ALL evening long and celebrated himself at the turntables. At least someone had fun. To me, it was a massive turn off and I missed Natasha Pavluchenko's show. Really sorry Natascha, but there was no way I could have listened for another 1h to Russian drinking songs. Potsdam Now has potential to develop itself into the right direction, once it has overcome minor mistakes (e.g. the endless discussion on wifi, goody bags, smooth running without long breaks). 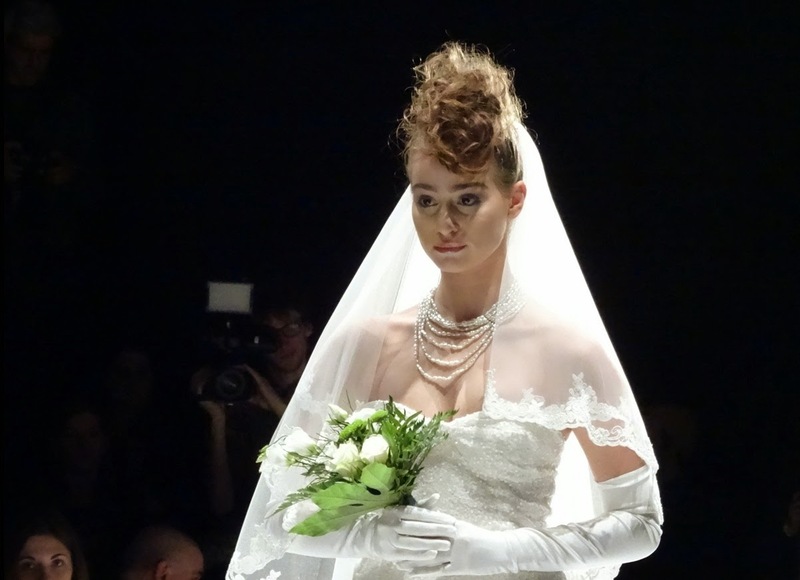 It is an interesting fashion concept which I can see will grow in the coming years to establish itself as an integral part of Berlin Fashion Week. Thank you so much for having me, I'm really looking forward to the next time. Thank you so much for reading today’s post, hope you’ve enjoyed the fashion show and will be joining me on my next adventure. Let me know if you’ve ever been to a fashion show before, which designs you liked best and if you enjoy high-end glamour events.